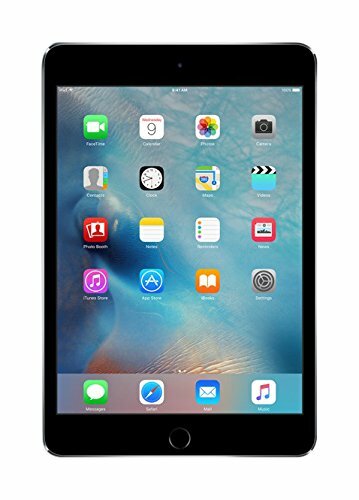 Apple iPad mini 4 (128GB, Wi-Fi, Space Gray). 7.9‑inch (diagonal) LED‑backlit Multi‑Touch display. 2048‑by‑1536 resolution at 326 pixels per inch (ppi). A8 second-generation chip with 64-bit architecture. 1.2MP photos. FaceTime video calling over Wi‑Fi or cellular. 8MP photos. 1080p HD video recording. Fingerprint identity sensor built into the Home button. Apple Pay with your iPad using Touch ID within apps. Wi‑Fi (802.11a/​b/​g/​n/​ac); dual channel (2.4GHz and 5GHz). Bluetooth 4.2 technology.